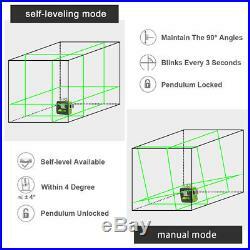 603CG 3 x 360 Green Laser Level Specifications. Class 2 (IEC/EN60825-1/2014), <1mW power output. Horizontal/Vertical Accuracy: ±1/9 inch at 33Ft. 130Ft (100 LUX), 200Ft with Huepar Laser Receiver LR-6RG. Operating Time with lithium battery: 7 hours with all laser beams on. Operating Time with AA batteries: 2 hours with all laser beams on. Power Source: Li-ion battery&4×AA (LR6) batteries. Operation Temperature Range: 14. Mount Size: 1/4"-20 and 5/8"-11. Avoid direct exposure of the laser beam to the eyes. The laser would be affected by strong sun light when work outside. Items in the Package. 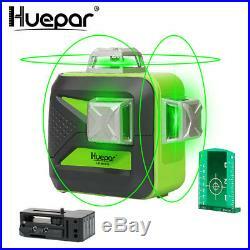 1 x Huepar 360 Green Self-Leveling 3D Cross Line Laser Level. 1 x Rechargeable Lithium Battery. 1 x Power Adapter. 1 x AA Battery Holder. 1 x Magnetic Pivoting Base. 1 x Laser Target Plate. 1 x User Manual. (Not including AA Battery). 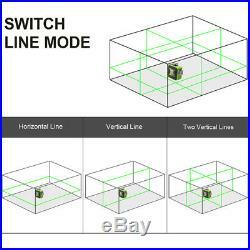 FULLY LAYOUT WITH 3 X 360 LINE LASERS: One 360° horizontal and two 360° vertical planes enable users to cover the floor, wall, ceiling all around the room. Two vertical lines cross at 90°angles makes user quickly visualize and finish square layout. 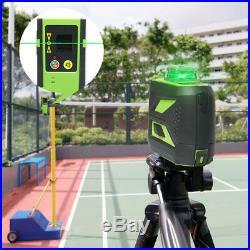 This 360 laser level is a complete level tool as well as an alignment laser aids in full room layout. MULTIFUNCTIONAL LASER TOOL: The one 360° horizontal and two 360° vertical laser lines can be selected individually depends on job site applications. With our smart pendulum system, this laser level tool self levels and indicates out-of-level condition while pendulum unlocked. Once pendulum locked, it switches to manual mode to lock lines for use at any angle. 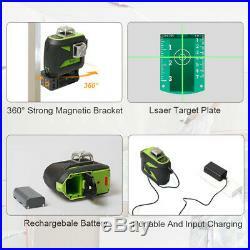 POWER-SAVING OUTDOOR PULSE MODE: This laser level projects green laser beam which is 4 times brighter than standard red beams with a working range up to 130Ft with an accuracy of +/- 1/9 at 33Ft. Besides highly visible green beam, a power-saving pulse mode extends laser range up to 200Ft with Huepar LR-6RG Line Laser Receiver in bright light or outdoor conditions and continuous working time. 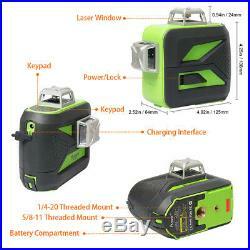 In addition, this laser tool can be used at job site with direct input charging even if take out the battery. Charging protection help prevent the tool from overcharge. 4 battery indicators on keypad allow users to know the current battery volume anytime. The laser also offers 1/4"-20 and 5/8"-11 mounting threads to suit different tripod threads. Strong magnetic pivoting base allows for attachment to metal track and steel. Huepar ships to worldwide. After parcel received and returning the item as the same condition as received. All questions will be replied within 24 working hours. Our working time:Monday to Friday. All Mails will be replied within 24 hours , except weekend. The item "3D Cross Line rotary laser level green Cross Line Laser Self Leveling 603CG 40M" is in sale since Monday, January 7, 2019. This item is in the category "Home & Garden\Tools & Workshop Equipment\Measuring & Layout Tools\Laser Measuring Tools". 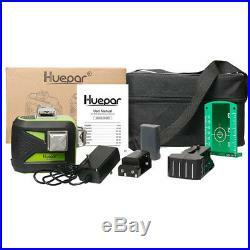 The seller is "huepar_store" and is located in . This item can be shipped worldwide.